Are you a whole bean grinder or thinking about getting started? Manual vs electric: Which is right for you? Stainless steel burr vs ceramic burr: What’s the difference? We want to know what you think: Do you have a favorite manual coffee grinder? Let us know in the comments! 6 Why Choose a Manual Coffee Grinder? 8 Stainless Steel Burr Grinder vs Ceramic Burr Grinder: What’s the Difference? Here are The Coffee Maven’s top-rated manual coffee grinders. Let’s take a more detailed look at our top 5 manual coffee grinders. PRIME DàY FAST-ACTION COUPON - Want to save an EXTRA 10% TODAY Only? Use Coupon at checkout: LLPRIME1. Limited Stock! Expires Today! PREMIUM QUALITY - Our top-performing coffee grinder is built using durable stainless steel that stands the test of time with everyday use. Plus its slim, sleek and travel-friendly design will make you the envy of your family and friends. THE PERFECT GRIND EVERY TIME - The Culinary Prestige Coffee Grinder has a built-in adjustable grind selector with over 18 click settings to ensure 100% precision control over the coarseness of your ground coffee. NO POWER NEEDED - Your Culinary Prestige Coffee Grinder doesn't need any batteries or power cords making it very quiet to operate. Portable design is Aeropress compatible and perfect for travelling or camping. The efficient ceramic burrs allow you to manually grind your beans with ease while the aroma of fresh coffee wafts over you! Purchase right now and receive a BONUS travel bag and cleaning brush (over $15 value) --- FREE! --Limited Quantity! 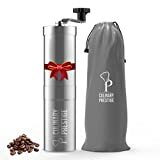 MAKES THE PERFECT CHRISTMAS GIFT - If you are looking for the perfect gift for that friend or family member that loves their coffee, then look no further. The Culinary Prestige Manual Coffee Grinder is your one-of-a-kind, unforgettable present. Whether it's for a wedding, house-warming, Birthday, Christmas or Valentine's Day you can give the Culinary Prestige Coffee Grinder with confidence. NO QUESTIONS ASKED SATISFACTION GUARANTEED - If you do not love it, simply return it for a full refund. You may end up buying more than one! Your friends and family will be asking where you purchased this amazing tool. Take advantage of the coupons below for discounts when purchasing more than one. This sleek-looking grinder holds 4-5 tablespoons of coffee beans, which can be ground to a medium grind — possibly medium-fine — in 2-5 minutes. The total time depends on your quantity of beans and grind setting. I’ve had issues setting a consistent grind size after disassembling the grinder to clean, though generally I can eyeball the proper grind setting by twisting the black knob attached to the ceramic burr. Overall it performs extremely well for the price and receives top marks among all manual coffee grinders. Can easily be disassembled for cleaning into handle, lid, top chamber, bottom chamber. You can also unscrew the ceramic burr to clean with the included bristle brush. I included pictures of the Culinary Prestige grinder in use on another post, which you can find here. The stainless steel exterior is super easy to keep shiny and has a modern look and feel. In six months of use I haven’t had any issues with this grinder. I bought this grinder on discount for $20 and couldn’t be happier with my purchase. Maybe it’s just me, but this grinder isn’t as large as the photo makes it look — it’s basically a 5″ cube with a hand crank on the top. But while its size may be deceiving, its artistry isn’t. This is a beautifully classic European hand coffee mill — not merely a grinder! — with a walnut-colored beechwood exterior and chrome-plated heavy gauge steel accents. B00004SPD9The premium materials do mean an inflated price, but this grinder performs as you’d expect. What are the benefits of a premium coffee mill? Unlike the Culinary Prestige grinder above, the Peugeot Nostalgie coffee mill has a stainless steel burr. You can grind up to 4 tablespoons of coffee in one sitting with a grind ranging from medium-fine to coarse. This grinder does not disassemble for easy cleaning. That’s definitely a small but notable negative. To keep this thing humming you should dust off the stainless steel grinder with a small brush after each use. Pro Tip: If you’re OK wasting a few beans with each use, grind those first to “clean” the grinder of old bean residue, then discard. This is an extremely high quality item. The grinder mechanism is made in Italy with everything else made in France. The stainless steel burr will hold up to repeated use. There’s no doubt this grinder will have a longer useful life than anything else on this list. Whether that’s worth the price is up to you. LIFETIME, SUPER SIMPLE GUARANTEE AND WARRANTY - If you don't like our Manual Coffee Bean Grinder at any time for any reason, will will give you your money back immediately. We stand behind all of our products without reservation, and we use them in our home every day. Heck, if we don't like them, why should you? But if you don't, we've got you covered. Period. Shorter and stouter than the top-ranked Culinary Prestige grinder, the Khaw-Fee (love the name!) HG1B manual grinder operates in almost exactly the same way. It has a larger capacity for ground beans than the Culinary Prestige, so it’s suitable for those looking to grind more volume, but it feels a little bit wobblier when using. Grind size is controlled by a knob connected to the burr and there isn’t a specific size setting to use. It’s more of a trial-and-error situation. I do love being able to see through the glass collecting chamber to make sure everything is going as planned. A downside of this glass chamber is that you can’t easily pour grounds into a narrow coffee maker, such as an Aeropress or Keurig My K-Cup. If you use a standard drip, French press or pour-over coffee maker, this may not be a problem for you. The glass portion is dishwasher safe and none of the components are going to pick up unwanted, rancid coffee aromas after repeated use. Khaw-Fee offers a one-year warranty and a 100% money back guarantee, but chances are you won’t need either. This is a sturdy grinder and performs just as well as the Culinary Prestige grinder that took down our top spot. Like the Khaw-Fee grinder above, the KONA grinder has a plastic top, glass bottom and stainless steel shaft; it performs almost exactly the same with the same strengths and weaknesses. This mechanical grinder’s smaller capacity could be a plus, though — it’s incredibly compact and is perfect for travelers, campers or infrequent coffee drinkers. Easy to disassemble with the same suite of moving parts as the other grinders above, the hardest thing about cleaning this style of hand cranked grinder is finding your ideal setting when putting it back together. As long as you drop it, you won’t have any issues with this grinder holding up. This high quality stainless steel burr coffee grinder to ensures a precise and consistent grind every time. This is the second stainless steel burr grinder on our Best Of list — the Peugeot Nostalgie Hand Mill is the other. The grind size is adjusted by twisting the knob on the top, allowing you to switch from a medium-fine to coarse grind. Its 4 tablespoon capacity is comparable to most other manual coffee grinders. My major bone to pick: You need to pour the beans into the grinder through a small sliding door in the lid, visible in the picture above. This door is way too small. I frequently spilled beans everywhere. I was tempted to rank another hand cranked coffee grinder in my top 5, but I felt the 3E Home Manual Grinder performed sufficiently well at a low enough price point to justify its inclusion. While it won’t perform as well as the premium Peugeot, this coffee grinder has declared its niche and sites there proudly: Antique look for an affordable price. The 3E Home Manual Grinder is easy to disassemble by separating the lid from the base. From there you have access to the underside of the stainless steel burr. The only access to the top is through the aforementioned narrow sliding door; that is, unless you want to unscrew the whole grinding shaft, which is a bit of a production. A simple brush, a cloth and some soapy water are all you need to get this grinder in tip-top shape. On a positive note, you can clean said burr without losing your grind setting. As someone who uses the top-ranked Culinary Prestige manual grinder, this advantage is not lost on me. This is the least durable grinder on this list. Overall it feels a little cheaply made, and my supplemental research turned up customers who complained about issues with the stainless steel burr; some noted it had a strong metallic odor while others even found rust that had to be cleaned. This category begins and ends with our top-ranked mechanical, hand crank grinder: the Culinary Prestige. Why is it so great on the go? Actually, there are dozens of coffee grinders which are nearly identical to the Culinary Prestige. They’re so identical it’s almost like they were made in some cheap Chinese factory before each company slapped their proprietary logo on the canister. But if you don’t like the cylindrical Culinary Prestige grinder, I do have another option for you: the Kohi All-in-One Ultra Portable Grinder/Brewer/Tumbler. 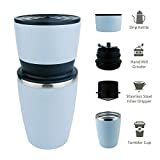 All-in-one design, drip kettle + handmill burr ceramic grinder + funnel mesh filter, travel mug are combined in one, portable and suitable for camping trip, office use, and travel. Perfect birthday or business gift! Smart and easy grinding, rotate manual lever clockwise by your hand. Stainless steel funnel filter & stainless steel vacuum mug, eco-friendly, super easy to clean, easy to re-use. Requires no batteries or electricity. With KOHI portable all in one coffee maker, you can enjoy the freshest coffee no matter where you are! It’s a pretty ingenious design, right? Add your grounds, mill by hand, add hot water, enjoy. I love this product and it’s great in a pinch, especially if you’re camping. The Culinary Prestige and the other portable models that made our top 5 best coffee grinders will do a better job actually grinding coffee, but small, portable — and most of all, cool — products like this definitely deserve to be featured. They can’t make a fine grind. If you’re an Aeropress, French press, drip or pour-over coffee drinker, that isn’t a problem. For espresso drinkers, and especially Turkish coffee drinkers, you need something better specialized. That’s where the Bazaar Anatolia grinder comes in. While labeled as a pepper and spice grinder, it’s your best bet for a manual Turkish grind. VERSATILE -BA Pepper Grinder available for grinding spices such as pepper, coriander, cardamom, mustard, cumin, sumac, rice. Not available for the big seeds such as nutmeg or corn. And not available for the wet seeds. ADJUSTABLE - You can adjust pepper grinders size with the screws on top. High Quality Cast Body and blades 6 different color alternatives. DURABLE with complete metal body and mechanism. There is no plastic parts on this pepper grinder. That’s some antique craftsmanship — and don’t forget to check out its price! The grinder’s brass exterior also comes in a variety of awesome silver, gold and copper colors. 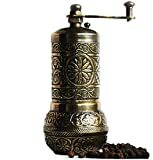 This truly is a the best manual Turkish coffee grinder given its price point. 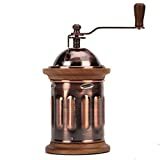 There’s no shortage of antique-looking coffee grinders; in fact, antique and rustic kitchen appliance are a weakness of mine. If you truly want something antique — as in something old enough for Grandma to have used — your best bet is to check out your local antique shop or eBay. For something that looks the part but is brand new, these are your top options. With a striking contrast of dark cast iron and light-colored wood, this coffee grinder looks as good as it performs. And it performs exceptionally well. Grind size is adjusted by turning the silver knob on the side of the grinder, and the easy-turn grinding wheel is as fun as it is functional. And whereas a lot of manual coffee grinders struggle to produce anything finer than medium, you’ll be able to get a good medium-fine grind with this machine. Constructed with less metal than either of the other antique coffee grinders, the Clever Chef Cast Iron Manual Coffee Grinder is smaller and lighter. In fact, it rivals many of the small, portable manual grinders discussed above. I love its easy-access grind size adjuster located at the top, where the rotating handle attaches, and it ditches the Old School grinding wheel. Whether that’s a plus is up to you. The drawer easily slides in and out, and the opening to add your whole coffee beans is large enough to either shovel in via scoop or pour in directly from the bag. 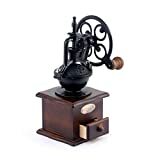 The tallest and most ornate of the 3 manual antique coffee grinders shown here, the Foruchoice Vintage Style Hand Cranked Grinder has a stoic, all-dark design — except for when you pull out the collecting tray as shown in the image. Like the Clever Chef grinder above it features the grind size adjuster at the top of the grinder instead of on the size. You’ll also notice how some of the components are labeled as plastic or plastic steel. Don’t worry about that plastic steel case. It’s an extremely hard and durable material. Why Choose a Manual Coffee Grinder? Manual vs electric: It’s the first decision you’ll have to make when shopping for a new coffee grinder. Less expensive You aren't sure manual is right for you. You don't want to spend $100+ for an electric grinder. Less noise You live with someone in a small space and don't want to wake them every morning. Less heat Heat can affect volatile organic compounds in the bean, negatively impacting final coffee. More compact You live in a small apartment and have limited counter space. You travel and would like to take your coffee grinder with you. More romantic You love the process of creating your cup, just like a cook picking herbs from the garden. I love waking up in the morning, adding my coffee beans and taking 2-3 minutes to grind them to a medium grind for my Aeropress. Looking for something more practical? Price and compact design. I swear by manual coffee grinders, but the connection I feel to my morning (or afternoon or evening) cup of coffee is a major reason, too. Faster You don't want to spend upwards of 3-5 minutes hand cranking your coffee every morning. Achieves finer grind You enjoy fine medium-fine or fine grind beverages, such as pour-over coffee or espresso. Easier to set grind size You'd rather select "setting #11" than try to dial a manual grinder's knob to what you think it was before someone changed it. Electric grinders are a great example of you get what you pay for. You may find you can improve your grind by “upgrading” from a $60-$100 electric grinder to a $20 manual grinder. If you go electric, please make sure it’s a burr coffee grinder. So, you want a manual coffee grinder. Material: Stainless steel, ceramic and wood. Stainless steel is lightweight, easy to clean, compact and durable. Ceramic has the most neutral taste and never imparts flavors, which stainless steel sometimes does. Wood is generally a design element and not part of the grinder’s functional components. It has great aesthetics but is usually clunkier. Size: How big is it? How much does it weight? There’s no better or worse here, just what suits your needs. Burr quality: Stainless steel or ceramic. I’ll cover this is detail below. Stainless Steel Burr Grinder vs Ceramic Burr Grinder: What’s the Difference? Most of the manual grinders you come across will have ceramic burrs, but steel burr grinders do exist. We even ranked 2 stainless steel burr grinders in our top 5. What’s the difference between stainless steel and ceramic? *Stainless steel burrs have higher thermal conductivity than ceramic grinders, so how is this an advantage? During grinding heat is produced in the bean as it breaks apart. Stainless steel grinders do a better job of absorbing this heat and transferring it into the grinder and away from the bean. Have you used any of these grinders? Do you have a favorite which isn’t listed? Comment below!